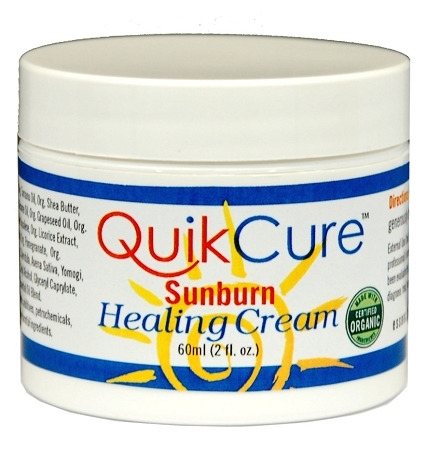 QuikCure Natural Sunburn Healing Cream is a powerful all-in-one sunburn treatment system in a jar. The patented active ingredients provide antiseptic, anti-inflammatory and anti-itching properties. Immediatedl calms and soothes sunburned skin. Supports your skin's natural healing process. Stops the itch fast and speeds up the healing process of cuts, burns, bedsores, diabetic ulcers, hives, sunburn, eczema, psoriasis, herpes, pityriasis rosea and other skin problems. Immediate results from the first application! Safe... Effective... 100 % Pure Natural & Organic...Safe for your entire family! Can be used in conjunction with other QuikCure topical care products. QuikCure Natural Sunburn Healing Cream is free of petrochemicals, pesticides, herbicides, irradiation, artificial colors or perfumes, hormones, GMO’s or other harmful chemicals. It is safe for the entire family. INGREDIENTS: Organic Aloe Vera Juice, Organic Shea Butter, Organic Coconut Oil, Organic Tamanu Oil, Sea Buckthorn Oil, Organic Rosehip Oil, Olive Squalane, Organic Glycerine, Xanthan Gum, Zinc, Olive Extract, d-Panthenol, Organic Calundula, Licorice Root Extract, Vitamin E, Organic Oats Extract, Organic Gotu Kola Extract, Colloidal Silver, Organic Wild Yam Extract, Essential Oil Blend. Organic Tamanu - has anti-bacterial, antibiotic, antioxidant and antiinflammatory properties that help in healing wounds, rashes, irritation, acne, acne scars, diabetic sores, burns, herpes sores, cuts, eczema and psoriasis. Organic Rosehip - antioxidant-rich oil that reduces scar tissue, hyperpigmentation. Has regenerating properties. Organic Sea Buckthorn - provides over 100 nutrients. Traditionally used for dry skin, damaged skin, scars, eczema, burns. Antioxidant Proprietary Blend - Noni, Pine Bark, Olive Extracts, Pomogrante exhibit very potent antioxidant, anti-inflammatory effects. AminoSil Complex® Vitamin Mineral Rich Blend - Colloidal Silver, Zinc, L-Lysine, d-Panthenol, Beta Carotene. Colloidal Silver - Colloidal silver is known for its powerful anti-bacterial, antifungal, anti-viral properties. It is also a strong anti-septic germ fighter. Zinc - Mineral that the body needs for the synthesis of collagen, which is a requirement for the healing of skin wounds. It helps sooth and heal the skin from itching, rashes, irritation, eczema, psoriasis. L-Lysine - Studies indicate it is effective against herpes, cold sores and canker sores. d-Panthenol - Soothes irritated skin and aids in wound healing. Prevents irritation, aids in tissue repair. 7 Medical herbal extracts with Liposome Technology, Licorice, Ginko Biloba, Wild Yam, Barberry, Calaguala, Pine Bark, Aloe, Gotu kola known for there Anti- Inflammation, Anti-Oxidation, Anti-allergic, Immuno-Modulation properties. Essential Oil Blend - Melissa, Oregano, Tea Tree, Ravensara, Lavender. Lemon Balm - (Melissa Officinalis) Used in Europe to treat cold sores and herpes simplex virus. The polyphenol in Lemon Balm make it an effective antiviral treatment and a first line treatment for herpes outbreaks. Organic Oregano Oil - Cornell University research found oregano oil killed 30 different germs and it helped to destroy the viruses that cause shingles, HSV-1 and HSV-2." …has been proven useful as an antiviral…rivaling pharmaceutical antibiotics … in eliminating microbes … without inducing production of drug resistant strains. Organic Tea Tree Oil - Used for thousands of years in Australia as a first aid to treat cuts, wounds, and skin infections. Has strong anti-viral, anti-fungal, antiseptic and antibacterial functions. QuikCure Natural Sunburn Healing Cream is free of petrochemicals, pesticides, herbicides, irradiation, artificial colors or perfumes, hormones, phalates, parabens, gluten, dairy, soy, corn, peanuts, mineral oil, GMOs or other harmful chemicals. It is safe for the entire family. Stops the pain fast and speeds up the healing process of sunburn and other skin problems. Dramatically reduces inflammation and redness. Immediate results from the first application. All-organic oils and moisturizers provide additional benefits to dry, damaged, cracked skin.